Reports by the UN, IMF, and U.S. Department of Agriculture have argued that Zimbabwe's devastating food shortages since 2000 are largely attributable to "severe drought"--a line that President Mugabe and other government officials have only been too happy to parrot. However, the reports in question relied either on unreliable, secondhand information or on data from a small sample of rainfall stations. Data from all of Zimbabwe's 93 rainfall stations indicate that the so-called "drought" of 2001-2002 was in fact just 22 percent below the country's 50-year average, and that rainfall in subsequent years was much closer to the norm. 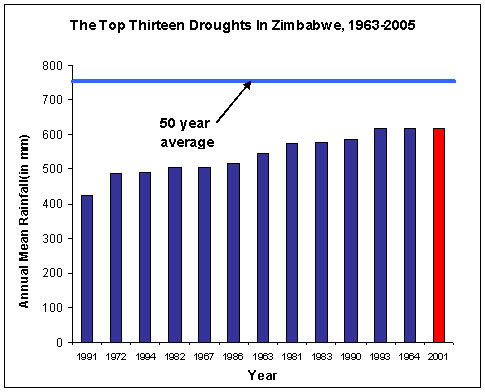 Indeed, as Figure 1 shows, in the past 40 years, there have been 12 episodes with lower rainfall than in 2001-2002, yet none of these provoked an economic collapse similar to what Zimbabwe now faces. Moreover, until the recent disastrous land reform, Zimbabwe benefited from extensive irrigation infrastructure, including more than 10,000 reservoirs, that helped to maintain agricultural production during the periodic dry spells. 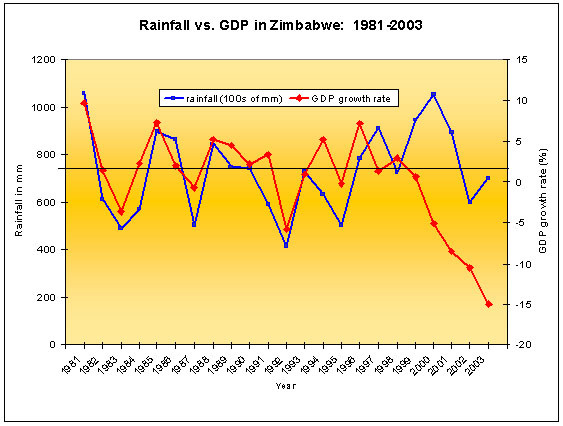 The remarkable correlation between GDP growth and rainfall sharply disconnected in the late 1990s as seen in Figure 2. As the economy imploded after 2000, rainfall briefly dipped in 2001/02, and then resumed close to or above its average levels. Reports from FEWS.net report average or above average rainfall in more recent years.